WASHINGTON (Nov. 07, 2008) -- "The progress that has been made in taking care of our Soldiers and the increasing survivability of Soldiers starts with the Soldier," said Secretary of the Army Pete Geren. 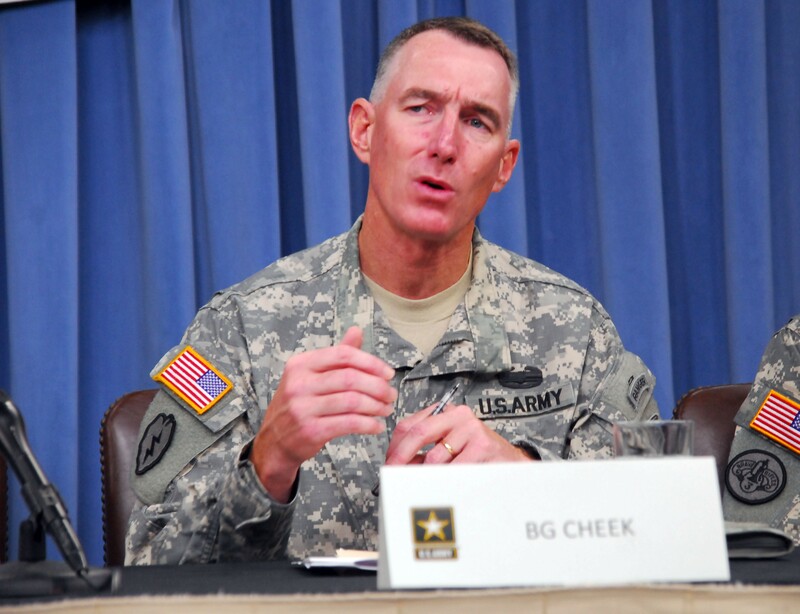 Geren and others from the Army's medical community gathered Nov. 7 at the Pentagon to discuss the current status of warrior care and the progress that has been made in caring for injured Soldiers. The event marked the beginning of "Warrior Care Month," an official month-long recognition by the Department of Defense and military services of their efforts to take care of wounded, ill and injured warriors. Brig. Gen. Gary H. Cheek, director, Army warrior care and transition, spoke Nov. 7 about the Army's 36 Warrior Transition Units. He said care provided to Soldiers in the units is something the Army should be proud. Soldiers in the Army are taught self-aid and buddy care and this is a prime factor in the 90-percent survivability rate of combat-injured Soldiers, said Maj. Gen. Patricia D. Horoho, commanding general of the Western Regional Medical Command, and chief of the Army nurse corps. "Every single Soldier is trained in self-aid and buddy-aid," said Horoho. "We do that so we have force multipliers across the entire theater of operations. They have the skills to save lives." Horoho also said advances in the medical equipment Soldiers carry with them in the field have contributed to their ability to help themselves and others. The medical kits distributed now to Soldiers include equipment to ensure continued breathing for Soldiers with chest wounds, various bandages and a new tourniquet that can be applied with only one hand. The Army has found that placing a greater emphasis on keeping open breathing passages and stemming blood loss have led to increases in survivability, Horoho said. The tourniquet in particular has been getting recognition from wounded Soldiers who have said it was instrumental in their survival. "Almost every single one said it was either them placing the tourniquet on themselves or a battle buddy doing it for them which is what saved their lives," she said. The Army is also testing medical products such as Combat Gauze and WoundStat as additional methods of reducing blood loss. Training for professional Army medics is also a contributing factor to the success rate of Soldiers injured in battle, Horoho said. "We've looked at ensuring we have highly trained combat medics -- the 68W -- every platoon has one 68W assigned," she said. "They are trained to national registry EMTB standards and that is augmented by advanced combat trauma training. That gives them an advanced skill set to make a difference in the lives of all warriors ... within that first ten minutes." The general said the Army has worked to improve upon the civilian sector's concept of the "golden hour" of trauma care, where the best way to guarantee survivability is to get the most critical care to a patient within the first hour of an injury. She said the Army has recast that concept as the "platinum ten minutes." When Soldiers get back to the United States they receive "level-4" medical care in stateside facilities like Walter Reed Army Medical Center in Washington, D.C. But following that kind of care, they may move to one of 36 Warrior Transition Units across the United States. It is in the WTUs that the Army has made great strides in assuring Soldiers don't just "get well" but that they get back on track with their lives -- either transitioning successfully back into the Army, or moving back into the civilian world, according to Brig. Gen. Gary H. Cheek, director, Warrior Care and Transition. There are more than 11,000 Soldiers currently in Warrior Transition Units or community-based Warrior Transition Units, Cheek said. "Each one is a Soldier with a unique medical condition, with unique goals and aspirations," he said. The Army has found success with those Soldiers by assigning each a triad of care. That includes a squad leader, a nurse case manager to manage medical appointments and schedule medical care, and a primary care provider to oversee managing multiple medical conditions. "That triad works with the Soldier to optimize their medical care," Cheek said. "It's a great system we have set up and the Army has a lot to be proud of." But Cheek also said the service has a way to go to make him happy in the way it delivers care to Soldiers. "We want to work on improving on performance of the organization," he said, saying the Army wants to make service provided to Soldiers in the WTUs more predictable to Soldiers and their families. "We can do that by improving performance in administration and making Soldiers the centerpiece of this."